If you’re looking for a creamy homemade keto pudding, look no further. This salted caramel pudding isn’t just rich and buttery with a dark brown sugar flavor — it’s also low-glycemic and keto. 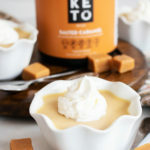 The secret ingredient of this pudding recipe is Perfect Ket’s Salted Caramel exogenous ketone powder, which doesn’t just taste delicious — it will help you get into and stay in ketosis. Plus, it can provide you with the energy you crave in the middle of a long day. So, get ready to gather your ingredients and a mixing bowl, because this pudding recipe is going to be on repeat. Research shows that beta-hydroxybutyrate (BHB), the exogenous ketone powder in this recipe, increases neurotransmitter release in your brain, which may increase brain function. Your body naturally increases BHB after a prolonged fast or intense exercise, but you can also increase it with supplementation[*]. In fact, low levels of BNF are related to neurological diseases like Parkinson and Alzheimer’s disease. And researchers theorize that increasing BDNF could be useful for the prevention and management of these diseases[*]. Gelatin is made from collagen protein, the main structural protein in your connective tissue. Cartilage is the main type of connective tissue on the surface of your joints. It’s responsible for the movement of your joints and overall joint health. In one study, researchers gave athletes collagen supplements to see if it would impact joint pain and deterioration by enhancing the health of their cartilage tissue. After 24 weeks of supplementation, the athletes had a significant reduction in joint pain[*]. Butyrate, a short chain fatty acid found in butter, may be a key nutrient for decreasing inflammation in your gut. Research shows that when people with Crohn’s disease take butyrate orally the inflammation in their colon decreases significantly[*]. BHB can also inhibit an immune protein compound called NLRP3 inflammasome. Inflammasomes are responsible for increasing inflammation in your body and are involved in many inflammatory diseases, making BHB a possible anti-inflammatory agent[*]. Start by melting your grass-fed butter in a saucepan at medium heat, then add in monk fruit and let it simmer. Monk fruit can burn, so keep your eye on it. If you’re using unsalted butter remember to add in a touch of sea salt to balance the flavor — you won’t regret it. Whisk in some heavy cream, and then slowly add in your unsweetened milk of choice (choose whole cow’s milk if you like your pudding extra creamy). In a small bowl whisk gelatin and water together, then add it to your pudding mixture until the gelatin is completely dissolved. If you’re a vanilla bean fan, you can add in some pure vanilla extract for a touch of vanilla flavor. Cover with plastic wrap and place it in the refrigerator for about an hour to let it set. Then, top with coconut flakes, whipped cream, or another small pinch of crunchy sea salt. One of the best parts about pudding recipes is that they stay fresh in your refrigerator for days. Store in small containers or mason jars to enjoy later. If you’ve been craving something sweet and creamy — look no further. This recipe is rich and satisfying on its own, but if you really want to kick it up a notch, add it to a scoop of keto-friendly ice cream. This salted caramel pudding is made with heavy cream, whole milk, whipping cream, and has a prep time of only 10 mins. It’s the perfect pudding recipe to keep blood sugar low and tastebuds happy. Melt butter in a medium saucepan over medium heat. Once melted, add monk fruit and set heat to low. Let lightly simmer for 5-7 minutes, stirring constantly, until mixture turns golden brown. Watch carefully to ensure it doesn’t burn. Whisk in 1/2 cup of heavy cream and continue to simmer on medium-low heat for 4-5 minutes. Slowly add milk and simmer for an additional 6 minutes. Turn heat off. Whisk Perfect Keto Salted Caramel Base into milk mixture. Adjust sweetness to taste if needed. Mix gelatin with water in a separate medium bowl and let sit for 1 minute. Turn burner back on and whisk gelatin mixture into pudding mixture. Whisk well until gelatin completely dissolves. Let pudding mixture cool for 10 minutes and then pour evenly into ramekins or small jars. Place in fridge to set up for 1 hour. While pudding is setting, pour 1/2 cup whipped cream into a mixer. Whip using whisk attachment for 2-3 minutes. Slowly add sweetener. Top pudding with whipped cream and sprinkle with toasted coconut if desired.